The Ontario SPCA and Humane Society is supporting Toronto-based dog rescue Redemption Dogs to help find homes for adoptable dogs displaced in Houston by Hurricane Harvey. On Monday, Sept. 11, more than 35 dogs waiting to be adopted prior to the devastation caused by the hurricane crossed the border into Ontario with the assistance of the Welland & District SPCA. The dogs are currently being cared for by the Ontario SPCA and are undergoing veterinary checks and any necessary medical treatments, including being spayed or neutered, before they will be ready for adoption. The costs to care for these dogs are high, which is why we need your help. Hurricane Harvey is now behind these dogs; please help them have a second chance at life. Once they are ready to find loving homes, the dogs will be available for adoption through Redemption Paws. In the meantime, the Ontario SPCA also has many dogs currently waiting for a loving home. By participating and raising funds for the Walk, YOU have the chance to WIN some amazing prizes! Top Adult Fundraiser Prize: Bissel ProHeat® Pet Upright Carpet Cleaner, a Kurgo dog hammock for your car, an Earth Rated leash dispenser, an Earth Rated counter display with 30 poo bag rolls and a Molly Maid gift certificate. Top Youth Walker Fundraiser Prize: $75 Gift Card of choice to one of the following stores: Toys “R” Us, Canadian Tire or Chapters Indigo. Top Corporate Team Fundraiser Prize: “Coffee Break” Gift Basket – Includes: Keurig K200 Plus Series Machine, K-Pods & Office Treats! Top Community Team Fundraiser Prize: $50 Gift Card of choice for each team member from giftcertificates.ca. Be sure to follow us on Twitter and Instagram for event day contests and share your Walk photos using the #FFL hashtag for another chance to win! The holiday season will be here before you know it, and our Paws & Give™ online store has just the deal to help you get ready. From now until Sept. 20, buy a 12-pack of animal-themed holiday cards for just $10. You can also add a “mystery pack” to your order for $5 which includes 10 additional random card designs. Shipping is included with your purchase. We’re making room for new inventory and everything must go! P.S. As a subscriber to Newshound, we wanted to give you the inside scoop: our dog and cat advent calendars will be available later this month! Don’t miss out on a barking good deal on the purrfect treat for your furry family members. Watch for the announcement – they’ll go fast! Looking for that perfect companion? There’s still time to take advantage of our special adoption fee of $50 for all cats and kittens. We have so many cats in need of loving homes. When you adopt a pet, not only do you get a wonderful friend, you also give an animal an incredible gift: a second chance to find happiness and love. Plus, you get great value, your pet will be spayed/neutered and vaccinated and you'll receive helpful literature on caring for your pet. 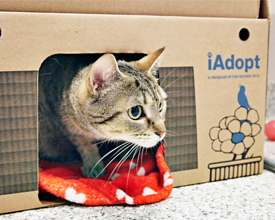 Our special adoption fee for all cats and kittens ends this weekend. Come into one of our animal centres today and find the perfect match. The No Hot Pets campaign has come to an end for 2017 and we want to thank you for taking the time to sign the pledge to save animals’ lives. Over 5,700 people showed their commitment to Animal Welfare and thousands of others helped spread the word through social media. The issue of owners leaving their pets in their vehicles during the hot summer months is an ongoing problem. It puts the safety of animals at risk and can even result in death. 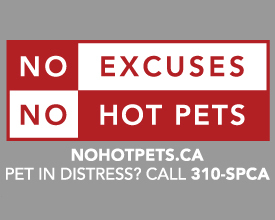 There is no excuse for leaving a pet unattended in a vehicle. We thank you for helping us spread this important message this summer! It’s hard to believe the dog days of summer are behind us. Autumn is now here and we are switching gears from No Hot Pets to fall safety. The days are getting shorter. The once bright sunny morning and evening walks have now turned to darker strolls, leaving your pets less visible. The different scents that accompany autumn can also distract your pets, leaving them susceptible to new dangers. Are your pets safe this season? Check out our blog for some great tips on making the transition to fall a safe and happy one for everyone. Is oral care part of your pet’s routine? 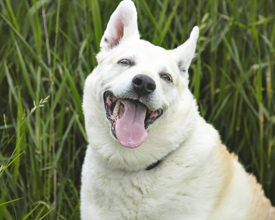 Oral care is an important part of maintaining the overall health of your dog or cat. Bacteria and plaque can harden on your pet’s teeth to form tartar, which can lead to gingivitis, receding gums, pain and tooth loss. Dental problems affect more than just your pet’s teeth. If left untreated, dental infections can spread to the heart, kidneys and other vital organs. Brushing your pet’s teeth is a key habit to maintaining oral care but there are other things that can help. 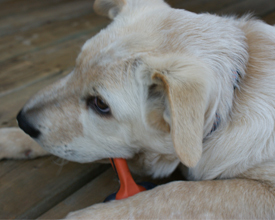 Read the Ontario SPCA blog for information on oral care and dental disease prevention.